7 Months of Silence are left…. This is a heads up to my situation. I am traveling for work, separated from my PC and with little time to do anything else but work. Hell, I cannot even fix my mobile’s coax! So it is unlikely you will be seeing anything new for the next 7 months. HAMsmithing – Simplex Repeater στο Κουτί! Μετά από αρκετές σκέψεις, μετρήσεις και μερικά λαθάκια, η ψήκτρα στον Ασύρματο του Simplex Repeater, ένα Baofeng UV-5R, έτοιμη. Ξεκίνησα με μια ψήκτρα 100x100x18mm. Και με αρκετό λιμάρισμα κατάφερα να πετύχω το τελικό σχήμα. π.χ. η λοξή τομή στο μπροστινό μέρος έγινε για να περνά η μπαταριοθήκη γύρω από την ψύκτρα και να κουμπώνει. I started with a 100x100x18mm heatsink. A lot of filing for the multifaceted final project was done. i.e. the oblong cut on the front is there for the AAA battery case to pass over and lock. Let alone the radio’s back was also complex with three levels of. HAMsmithing – Collapsible Yagi Antenna. Almost Done, to be Redone! I am one soldering away from finishing this thing, my collapsible VHF Yagi. Here it is in transport configuration. Here is my method of soldering the Anderson PowerPoles easy and cleanly. Start with tinned cable ends. Place the APP contacts on the work surface oriented the way they will be placed in their plastic housings (this is with the split on top). Touch the CLEAN tip of your soldering iron on the contact’s barrel. When sufficiently hot, start feeding solder in the contact’s hole. How much you will find by trial and error. Today I made a step further in the Collapsible Yagi Antenna build. The coax connection module is finished, sans the hot melt glue that will help keep things together. Else the antenna beam would be done today. The thing is that this build must be prototyped and done form the inside out. On the right is the connections’ module with one of the driven elements placed, and a ring of PCV pipe to simulate the boom. On the left is a simulation of the way the connection module was assembled. The 3mm bolts pass through the 16mmPVC pipe section. Then through the 20mm pipe section that has room for the nut. You can also have a look at this pic. Stay tuned! This build is almost done. It is just a Baofeng handheld connected to a Surecomm simplex repeater device and a DIY Li-ion battery pack. The box is -for the time being- a metal cookie box with added lid insulation. I favor the material, ‘cos it allows heat dissipation. Some time ago I organized my radio gear in small kits. Each one is completely self contained, including all relevant items. i.e. 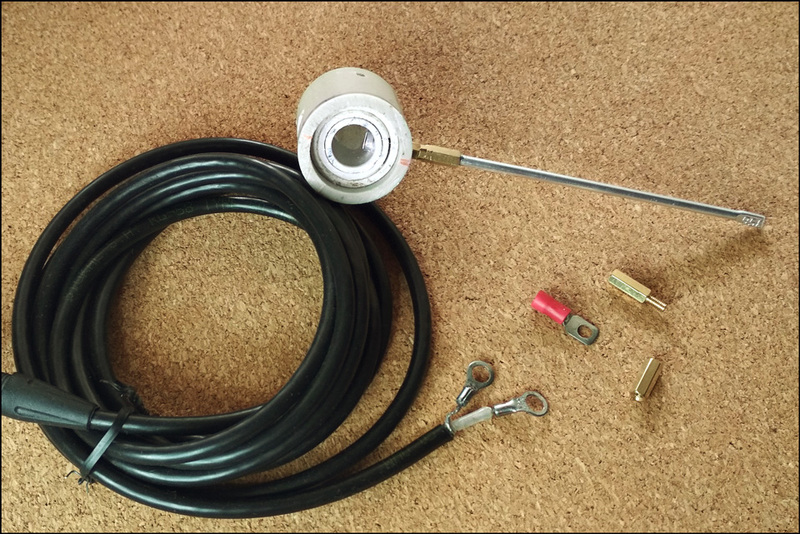 The wire dipole kit contains both the antenna, its coax cable, possible coax adaptors, plus the necessary cord, zipties etc to mount the antenna. That method requires a lot of duplicate items (i.e. coax cables) and material, but it is easy to use without worrying about forgotten items. let alone there is lot of redundancy in the system, a fetish of mine. Now it is time for labeling the contents in each bag plus coloring for fast access. Years go I started an ambitious project. to make a collapsible Yagi antenna that its parts would store inside a section of the cylindrical boom. After making a working model of it on a piece of 1×2 wood length I put it on the hold cos I was not satisfied with the way the driven elements would attach. One step forward by and I have this. Motherboard Standoff/Risers, screws, ring terminals and nesting sections of PVC pipe. I just hope it will not take a year more to finish it. For a month of more now, wordpress is getting an attack of fake accounts subscribing to blogs and spamming their comments. All the fake accounts come from outlook.com e-mail addresses. Trying to battle this I think I may have deleted some real subscribers that use Microsoft Outlook. I am very sorry for this. And I do not know of a way to re-list you myself. I trust that you have found this blog of value enough, to go to the trouble to re-subscribe/follow. Click to follow this blog and receive notifications of new posts by email. We will not spam you or use your e-mail for any other purposes.